Make one of these cute, retro pillows covered with pom poms to jazz up your decor. This is a guide about making pom pom pillows. I was needing to know how to do the pom-pom pillow board. I have a frame that is a 15 x15. There are 9 nails spread evenly apart. I have attached a picture, not a great drawing but hopefully you will get the idea. If you need more info, please email me at angelfyre05 AT gmail.com. My name is Cathy. My loom is 24 by 24 a total of 44 nails 11 on each side about 1and a half inches apart. Its made with 2 inch wide boards. Question: How Do I Make Pom Pom Pillows? I want to make pom pom pillows for Christmas. Can someone help me? Watch a Hallmark movie while you make them! Makes it a fun evening! How do I make the frame to make vintage pom pom pillows? I need directions. Thank you. First make a wood frame larger than the finished size of the pillow top. Next mark the frame at carefully measured intervals but I don't remember if you want an even or odd number of marks. Drive long nails into this marks deep enough to stay, but leave sticking out. The yarn is woven back and forth across these but I don't remember the pattern; I presume you do all one direction and then at the corner, go around the nail there and go in the other direction keeping the tension the SAME on the yarn and do this until there are at lease three yarns around each nail. It can't be too tight or you will never be able to to slip the yarn off the nails. When you have finished weaving the yarn, next make the pompoms by tying three or four (again not sure of the number) pieces of short yarn around the yarn on the frame where the yarns cross. Fluff out and trim, and then carefully remove from the frame. Sorry I can't be more exact. Hi I have been making these pom pom pillow frames for 60 years,and still teaching in the schools, if I can help you. I am looking for the pattern to make pom pom pillows and rugs. I need all the information, how to make the loom, and how to make the pillow tops/rugs. I made one about 40 years ago when I was in elementary school, but the great aunt that taught me how to do it is no longer alive, and no one around where I live knows the information, but they remember the pillows and rugs! Thank you, but I was looking for a frame that nails on it that I wound yarn around many times, then tied and clipped. Your rug looks it would be fun to run my toes through! I might have to try making one of those. I'm looking for the dimensions and specs to remake a square box made of wood used to make the old yarn pom pom pillows. Please is there anyone out there that can help? If it was me, I'd buy a wooden picture frame the size of the cushion I wanted and measure it. Put in nails about 2 cms apart. I know there is supposed to be an odd number on each side. The type of looms used for weaving often have 1 cms apart so I guess that 2 cms will be right for the pom poms. You might have to have a few experiments to get it to suit you. Long time since I've done those cushions. My last attempt was by making a smaller loom out of card not wood. The frame should have 2 sides even on opposite sides and 2 sides odd. I need to know how to make the frame and directions on how to wrap the yarn around and how to tie off and remove the pillow top. Can someone give me info or directions on the size of frame? Can anyone tell me what is the best way to tie the centres? Thanks. I use to have a frame and instructions for making pom pom pillows, but have lost both. Could someone please send me the instructions for the making of the frame? Thanks for the help. I have finished wrapping the yarn onto the square board with the nails, I can't remember how to cut the four corners. Please help. Does anyone remember how to make yarn pom pom pillows? What I remember is that you use a homemade wooden frame with nails and you wrap the yarn around the nails. To make the pom poms you tie the yarn, but I can not recall exactly how to do it. This craft was popular in the 70s. 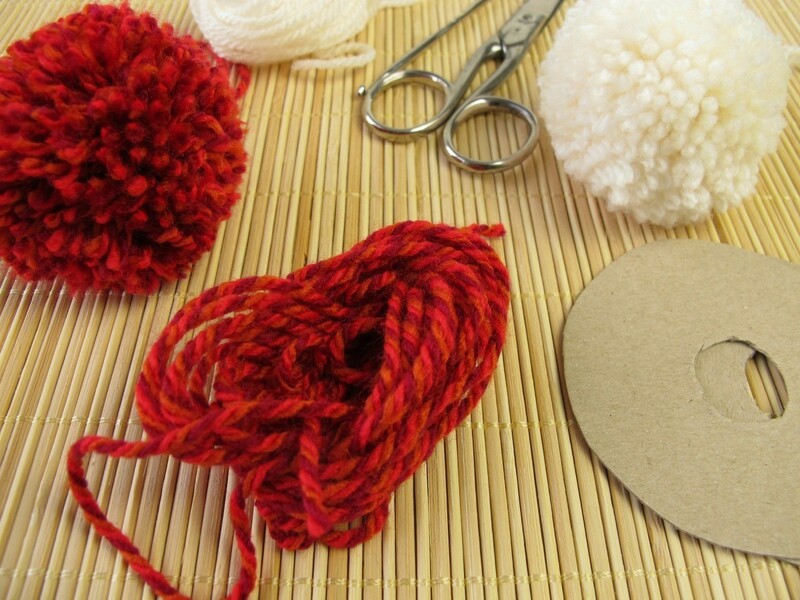 Yarn, sharp scissors, 3 pieces of cardboard (or other sturdy material) - 1 (3" x 6") and 2 (2" round circles). Notes: My cardboard rectangle is cut to about 1" larger than the width of my desired pom, but the length is cut to my desired tassel size so I can use it for tassels as well. I just used a piece of a box. 1) Make the pom pom tool: Cut a slice out of the center of the larger cardboard piece that is about 1/2"-3/4" wide by 2" long. 2) Loosely wrap the yarn around the center width of the cardboard 75-100 times for single strand of worsted weight. You'll need to wrap more for thinner yarns and less for thicker or doubled yarns. The density of the pom depends on how many times you wrap the yarn. 3) Cut the yarn from the ball. Cut a separate piece of yarn about 3" long. Take the short piece of yarn and thread it through the center hole on one side of the bundle, around the back of the wrapped yarn, and back through the center hole on the other side of the bundle. Make 2-3 tight knots to secure the center of the pom. 4) Cut the bundle of yarn at each edge of the board, taking care not to cut through the knot or center hole. 5) Carefully pull the pom out through the center hole. 6) Flatten the pom between the two circles of cardboard so that the knotted piece of yarn is sandwiched in the center. Begin to trim the pom to the size of the circles (crust-less pom sandwich). After the first trim, take the pom out, fluff it and rotate so you smoosh it flat in a different spot and trim between the circles. Continue to rotate the pom, smoosh it between the circles and trim until it is fluffy and evenly trimmed. If you want to make the pom smaller and denser either make smaller cardboard circles or continue trimming free hand. I think I know the one that you are talking about as I have the board here. I make them myself as well to give away as gifts for Christmas and birthdays, and I also sell them. If this is the one you are talking about, you have a board (don't know the size right now as it is in the shed) that has nails in it all the way around it with two nails that are extra in one corner and they are for the start and finishing tying off of the yarn. I always start with a different color of yarn on the bottom 2 or 3 rolls so that it is easier to know which ones to cut when you are done and you will not be able to see these colors when the pillow top is done anyway. Once you have the "base" color on and tied, then go to your next color or colors that you want. Once you have all the rolls on and tied off you can start making your pom poms now. To make your pom poms, take the same color as the last color that you used and in any of the cross sections that you have (I always start in the center), you tie each cross section from both sides ( one side and then the other. Do this until all cross sections are tied very tight. Once you have all of them tied and in both directions you are ready to start cutting. I always leave my pillow in the frame while doing all of this as it is so much easier to make still in the frame. Now back to the pom poms. After all cross sections have been tied, very careful as not to cut the wrong strand of yarn, half way in between the tied cross sections, cut in the middle of the straight pieces, being very careful as to not cut the bottom 2 or 3 rolls that you started with. You are now making the pom poms. Once you have all of them cut you can now fluff them if you want to still on the frame. After all that is done, now you can cut half between all the nails holding the yarn for you. Once that is done, you now have a pom pom pillow top.